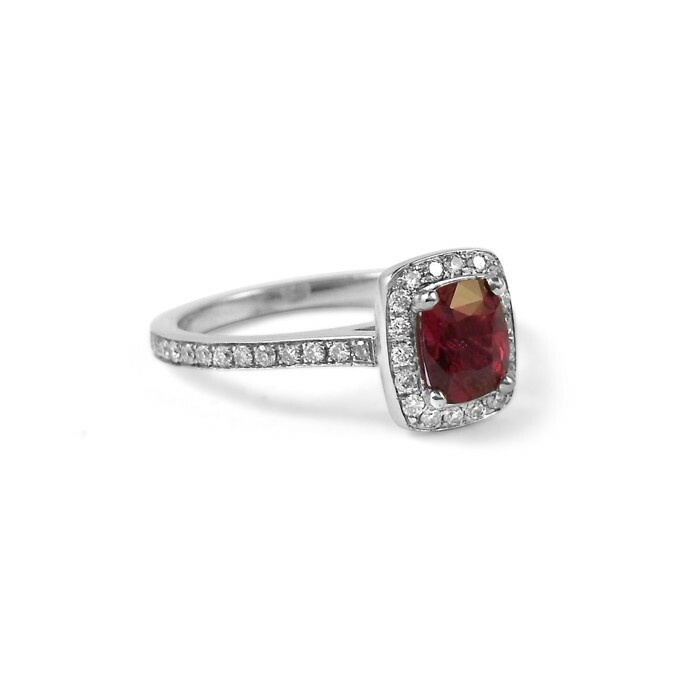 The red ruby in this delicate ruby engagement ring is surrounded by pavé diamonds. The ruby is natural and unheated and originates from Sri Lanka. It is a vibrant red and beautifully cut in a way that makes it really sparkle. Red sapphires are called rubies. A ruby gets its colour from the presence of the element chromium in the growth matrix. The more chromium that is present in the environment in which it grows, the pinker it gets. If enough chromium is present, the sapphire becomes saturated enough with colour to be classified as a ruby, and if too much is present, the sapphire gets too dark and looks black. The most valuable colour of ruby is called pigeon's blood red, which is a bit gruesome but has been used by gemmologists for centuries. Ruby is the birthstone for July, and the traditional gift for celebrating 15th and 40th wedding anniversaries and birthdays. Its name comes from “rubens”, the Latin word for red. Rubies have been associated with good fortune, passion and love, the sun, freedom and power. In Sanskrit, ruby is “ratnaraj”, meaning “King of Gems”. It is believed that rubies worn close to the heart can increase energy levels and bring the wearer health, wealth, wisdom and love. With a hardness of 9 on the Mohs’ scale of hardness, rubies are relatively durable. They are also relatively tough and easy to keep clean. 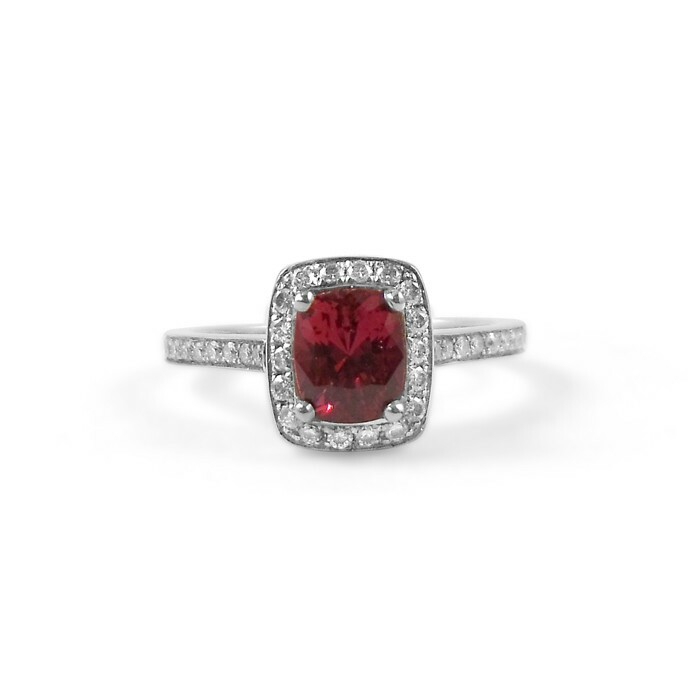 While a ruby worn every day for years is likely to show wear and tear along the facet edges and do break occasionally, rubies and sapphires are among the few gemstones suitable for use in engagement rings, and they are absolutely gorgeous when they are well cut like the one in this ruby engagement ring!